When we designed Expressive Glass, our first consideration was safety. Anyone can install some torches, buy some glass and tools, hook up some gasses, plug in an annealer, open a window, and call themselves a studio. But that's not the kind of studio we'd want to work in. Here are some of the features we installed to ensure everyone's safety. 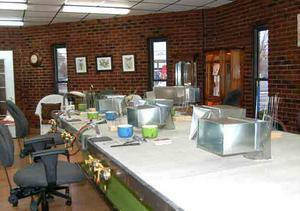 Each station has its own exhaust hood tied into a 2000 cfm fan that removes oxides and byproducts of combustion. Our propane tanks are housed in a locked cage safely placed behind cement barriers outside the building. The oxygen tanks are stored in their own cement block room and held in place by chains. Gasses are piped directly to dedicated regulators at each station. The spacious work surface is made from non-flammable cement board. We have 3 fire extinguishers, which we hope to never need. In 2006, Vicki Schneider fell in love . . . with glass. 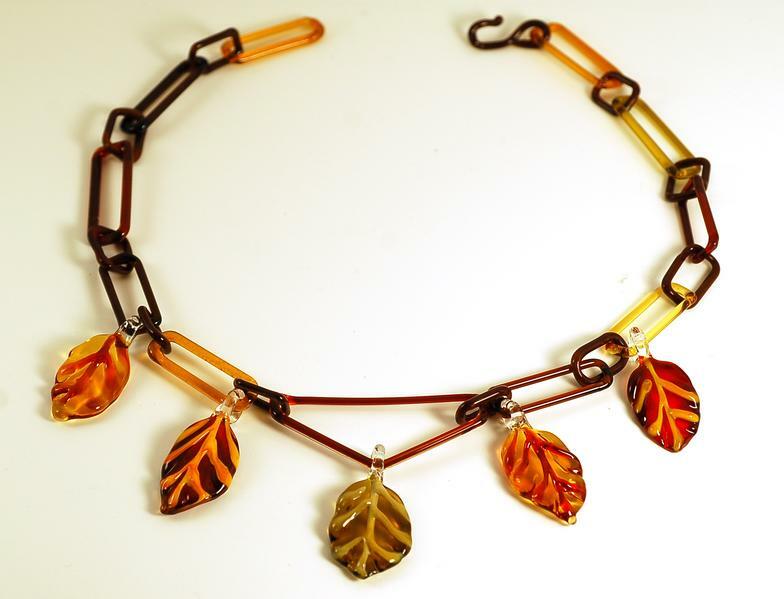 Not having any idea how glass beads were made, Vicki signed up for a weekend class taught by Caitlin Hyde at The Studio (Corning Museum of Glass). She didn't know what she was going to learn, but by the end of the weekend, she had found her passion. Since then she has worked nearly every free available moment improving her skills and developing her art. 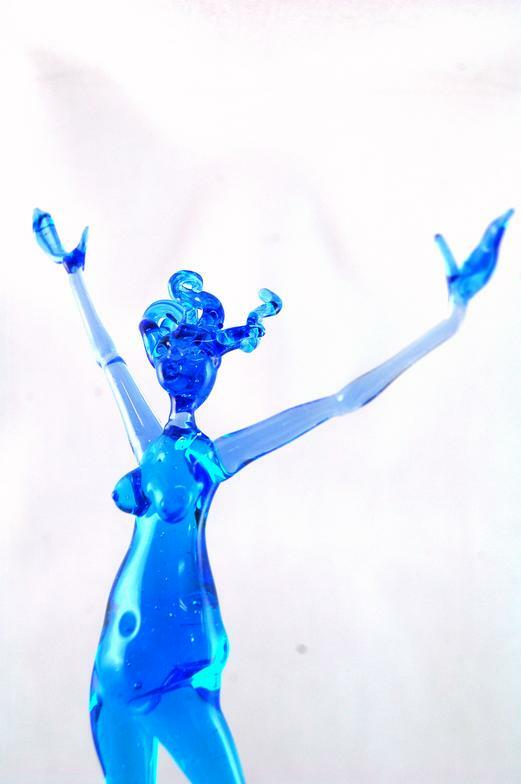 Vicki opened Expressive Glass in 2009 and has been a full-time glass artist since 2012. Prior to that, she was an international speaker, consultant, and trainer, sharing the QuintEssenttial Performance (tm) Model, which she created, with business owners, executives, and staff throughout the US, Canada and the UK. 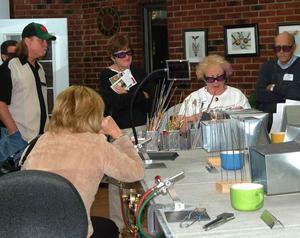 Vicki is committed to expanding the glass community in Western New York. With that in mind, she has hosted the following top international instructors at Expressive Glass; Loren Stump (2010), Bronwen Heilman (2011), Emilio Santini (2012), and Kristen Franzten Orr (upcoming, September 21-22, 2013). 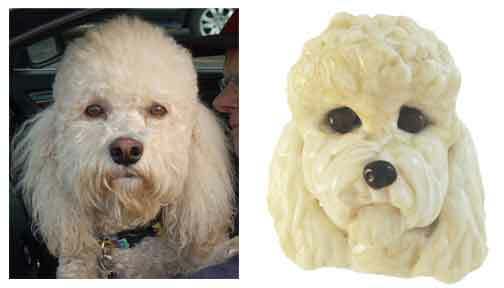 Vicki's creations are sold in fine-craft stores and galleries, including the Corning Museum of Glass and the Memorial Art Gallery. 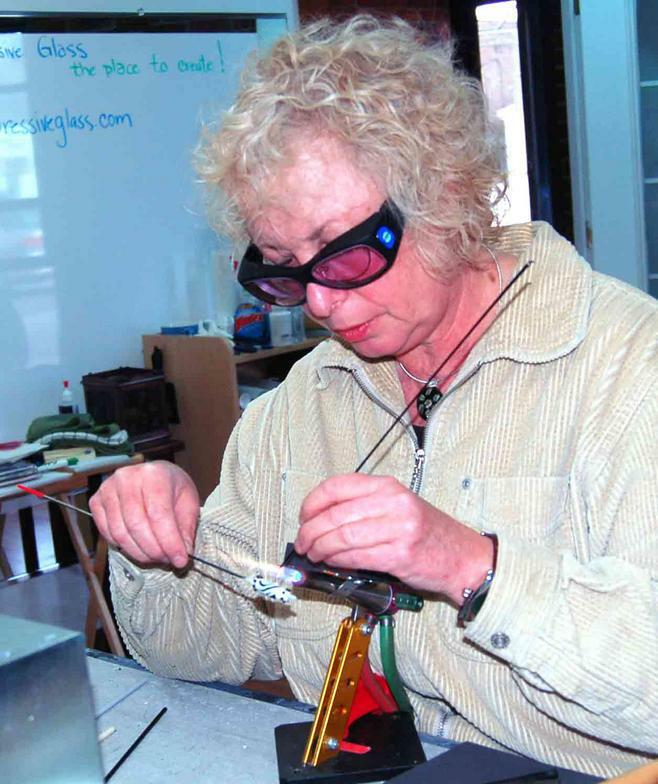 Her sculpted glass dogs gained international attention when she was featured as “Artist of the Month” by Beading Times and as when they were selected as part of the 6th and 7th “Annual Gallery of Women in Glass” published by The Flow magazine. Beads of Courage selected her as one of ten national glass beadmaking artists to participate in their first Bead Design Challenge and transform a child’s winning design into a bead. Here are a few pieces of Vicki's work. See more Glass Art by Vicki. 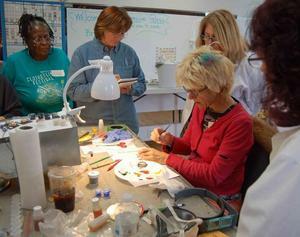 First and foremost, Expressive Glass in Buffalo, NY, is a teaching studio. We are dedicated to continually improving our own skills and helping our students do the same. Our founder Vicki Schneider is not only an accomplished glass artist, she is a respected expert and published author on how adults learn. Our studio is safe and welcoming environment, providing opportunities for new and experienced flameworkers to learn, develop their skills, and be part of our growing glass community..
As Robert Redford once said, "Art is the language of the soul." When we tap into the creative essence in each of us, a certain calm occurs. At Expressive Glass, we feel that calm everyday and we strive to help others experience it as well. You may say, "but I'm not a creative person." You'd probably be surprised. Think back to the happy times you spent as a child coloring, whether inside or outside the lines, or those times somewhere in your past when you drew purple dogs or created fantastic sea creatures.That creativity is still inside you; it's just looking for an outlet. When you begin working with glass, you will likely feel like you are patting your head, rubbing your stomach, and hopping on one foot at the same time. But with some practice you can achieve that calm and awe we are talking about. When that happens, time will pass unnoticed. And no matter how bad a day you WERE having, all your stressors will fade away. 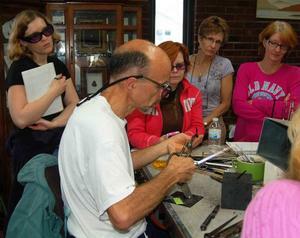 We often hear flameworkers talk about how meditative working with glass is. Watching molten glass glow and flow can be trance-like. Vicki Schneider, our founder, recounts how flameworking gave her the strength and calm she needed to deal with the progressive decline and eventual death of her beloved parents. Whether you are looking for a new hobby, a way to express yourself, or you just need some quiet time for yourself, we invite you to try working with hot glass. It may become your new passion. If not, at least you will have some amazing stories to tell your friends and family.